Bernie was born on September 8, 1941 in Brooklyn, NY. Fast forward his life many years he is now senator of the great state of Vermont. “The Green Mountain State” Vermont earned that nickname because half of the state is buried under a Forest. Not so much buried but covered in 75 percent green land, if that makes any sense. Bernie has strong belief’s in bringing back the middle class and simply being fair with the wealth of this country. It is a fact that the top 1 percent continue to have money funneled their way for personal interest. If you had a chance to check out the video that I shared, you will hear Bernie say “I will love to beat Donald Trump”. He does not believe in anything Mr. Trump is saying to the american people. 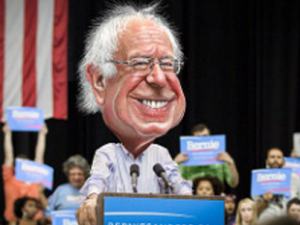 Mr. Sanders is all about redistribution of wealth bottom line. I personally like his approach it is so simple to understand. If Bernie does get passed Secretary Hilary Clinton and leaps to trump it will be interesting for sure. Both men are from New York, Bernie from Brooklyn and Trump from Queens. Knowing how outspoken and charismatic these two men are should make for an interesting debate. One must not forget if I had to give the edge to anyone it would be Bernie he has way more political experience than Mr. Trump has had wives, cheap shot. In case you didn’t hop over to Bernie’s Profile page let me refresh your memory about Mr. Sanders accomplishments that separates from Mr. Apprentice himself. In 1971 he was a member of the Liberty Union Party. From 1990-2007 Bernie was a Member of the House of Rep.
And now he is Senator of Vermont and has been for some time now. Buried in these bullet points is tons of experience, failures, victories and defeats. Clinton is Clinton no denying the power the name brings. Trump is an entrepreneur and entertainer, Bernie seems to be genuine and has been in trenches for years I mean look at him for gods sake. If voting polls opened to today and our votes decided our next president this dude would probably be the one to choose. Numbers don’t lie and Bernie has a proven track record, he is for the people and when he is in office he will prove the world wrong and bring back the middle class.